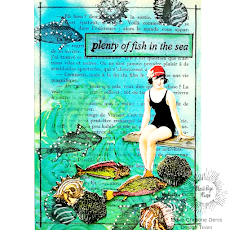 It's Karen here today to share my underwater creation featuring the lovely Misty Mermaid stamp by Rick St Dennis. Hold your breath...we're going under! 1. Color the mermaid's skin & hair with chalks. Add her facial details and shading with colored pencils. 2. Paint the mermaid's tail with pearlescant watercolors in shades of blue & green. 3. Carefully fussy cut the mermaid. 4. Create a watery background by applying green & blue alcohol inks to glossy cardstock. Then use permanent black ink to add a subtle impression of bubbles randomly across the background. 5. Attach shells over the mermaid's bust. 6. 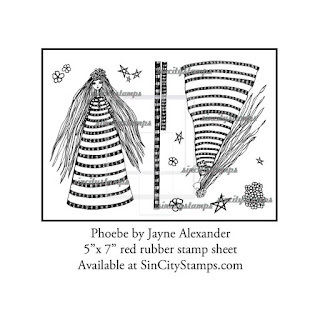 Stamp the angel's hair (Pheobe) multiple times, paint it green, & fussy cut to create the underwater vegetation. 7. Attach the mermaid & vegetation to the alcohol background. 8. Attach a large shell embellishment to the lower right corner. Embellish with various sea-life charms or buttons. Finally, use clear epoxy medium over some of the stamped bubbles. Create smaller bubbles in groups of three and set aside to dry.